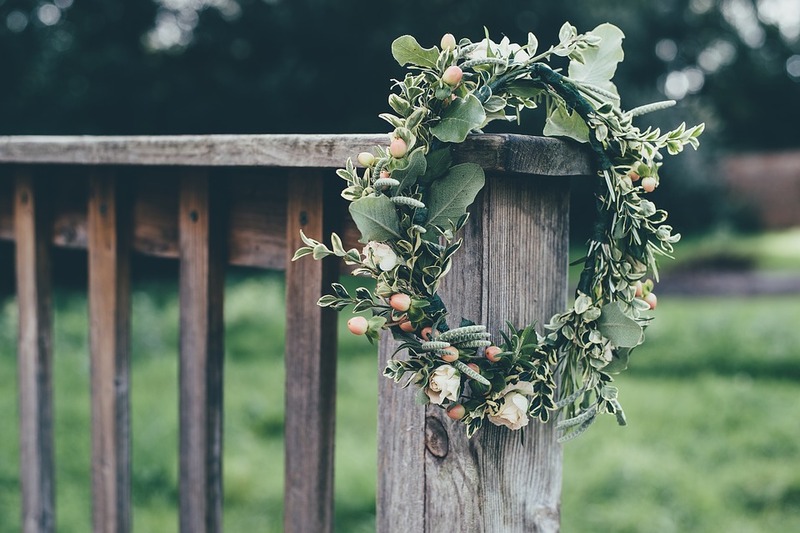 If you and your partner want to honour your magical practice and commit to each other via a gorgeous ceremony, then a pagan wedding – also known as a handfasting ceremony – is one of the most powerful ways you can formalise your union together. Like many other Pagan and Wiccan practices, handfasting is a blend of modern energies and ancient traditions. Handfasting has its roots in Celtic betrothal practices, where the groom and bride-to-be had a ceremony of intention which involved fastening their hands together. The betrothal would last for a year and a day, giving the intendeds a chance to see if they were sure about their union becoming permanent. Over time the ceremony became so elaborate that the ceremony itself became considered a wedding. In modern times handfasting is often practiced by Pagans and Wiccans, however you don’t need to follow either spiritual path in order to have a handfasting ceremony. It’s a very inclusive ritual and the only real requirement is to have a spiritual affinity with the concept and the spiritual energies of handfasting. 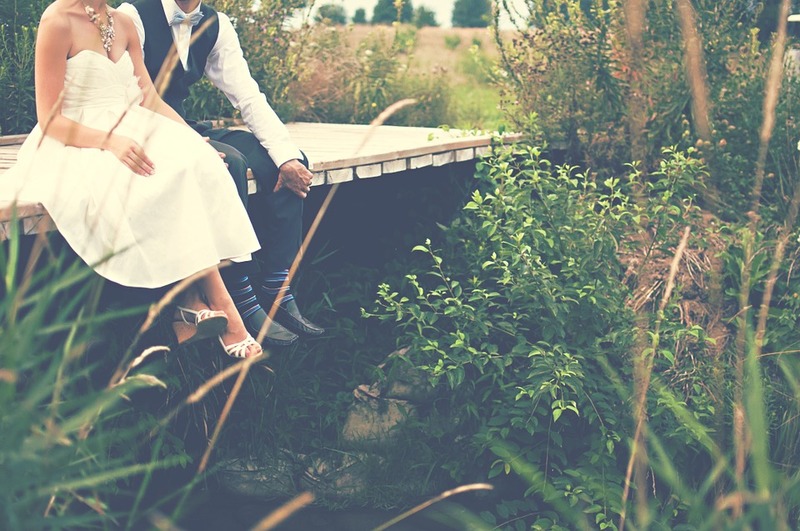 Why would you choose a Handfasting Ceremony? A handfasting ceremony by itself isn’t legally binding, however it’s a representation of the union of heart, mind and body for as long as love shall last between the couple. For many people it’s a chance to incorporate their spiritual beliefs within a ritual that can be highly individual. Some people choose to commit to a year and a day, after which they renew their handfasting, and others have a ceremony to honour their love for as long as both parties wish to remain bound together. A handfasting is a wonderful option for those who like to have the freedom to express their love in a way that feels right for them, and because it can be performed almost anywhere (so long as the venue / location allows) many people choose to visit sites which have spiritual significance for them. The stone circles at Avebury and Stonehenge in the UK are two very popular sites to perform pagan wedding ceremonies. There are also plenty of venues and offficiants in Scotland, where the tradition is believed to have originated, who offer their services to help people get handfasted. Handfasting is very inclusive and so you can be any age (over legal age of consent! ), gender, sexuality and relationship configuration. What matters is the intention of the parties involved to commit to each other and celebrate their love. What happens during a Handfasting? Because handfasting can be personalised so much, each individual ceremony can have as many elements as the couple likes. All handfasting ceremonies involve the tying together of the couple’s hands using ribbon or other cloth, to symbolise the joining of hearts and souls. The exact nature of this can vary from both hands being bound together, to just one from each person. The type of knotwork and material used can also vary. Many opt for woven handfasting ribbons in a Celtic knotwork design, bound in a beautiful figure of eight to represent infinity. Others may choose to have cloth with embroidery or other symbolism on it that is meaningful to them. During the binding the person you have chosen to officiate may read vows and you may repeat them. Poetry, ritual songs and verses or other readings can also form a part of the ceremony. Rings are often exchanged and drinks such as mead or wine are offered in celebration. In many handfasting ceremonies and pagan weddings the ‘jumping of the broom / besom’ plays a role. The couple jump it after their hands have been bound. It’s thought that this ritual represents jumping from the ‘wild’ to the ‘hearth’ and the comfort of building a life and home together. Many chose to get handfasted at Beltane, where the energies of fertility and union are at their peak. Once bound together the couple will often jump the Beltane fire together to seal their commitment. In other ceremonies a fire is also used as part of calling the four elements, and the couple jumps over it. Other people forgo the ritual fire but use elements of Pagan and Wiccan belief that resonate with them and their beliefs. 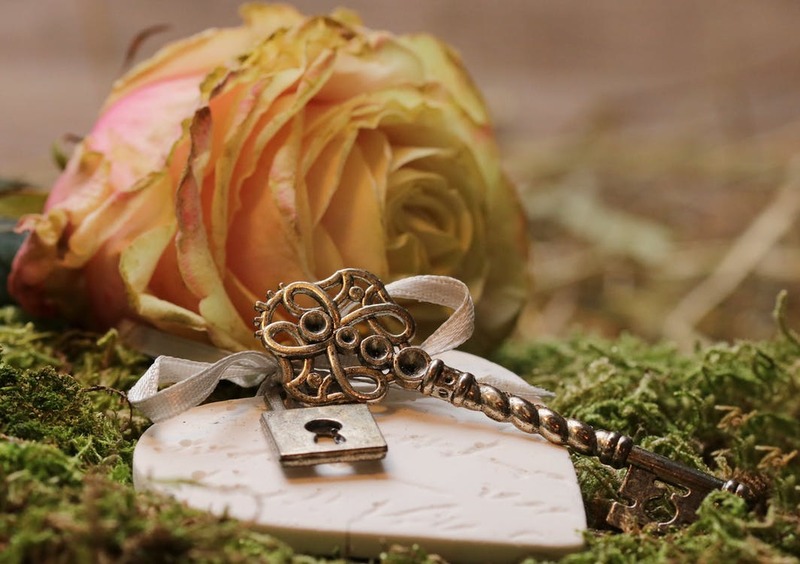 This may include using candles, crystals, flowers, ritual magical tools and invocations or other items, and will depend largely on each couple. Some couples opt to have large gatherings of friends and families, and others choose to ‘go it alone’ and have a very small and intimate ceremony. When it comes to what to wear many people choose traditional wedding attire such as white bridal gowns and formal suits, whereas others choose clothing that is more unusual. 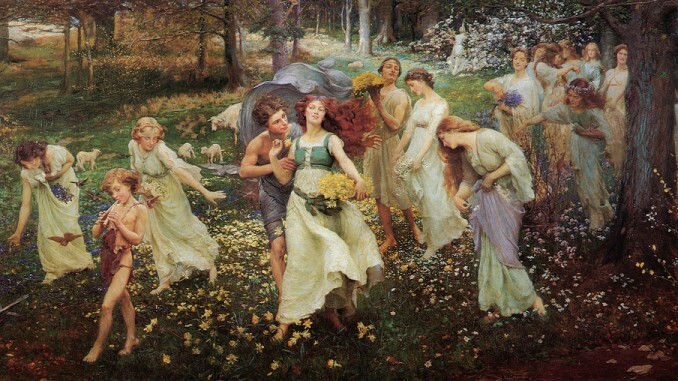 Weaving flowers and ribbons into the hair and wearing cloaks, and other ritual and magical clothing is a popular choice for pagan wedding ceremonies. However, like almost all other aspects of handfasting you are really only limited by your preferences and imagination! 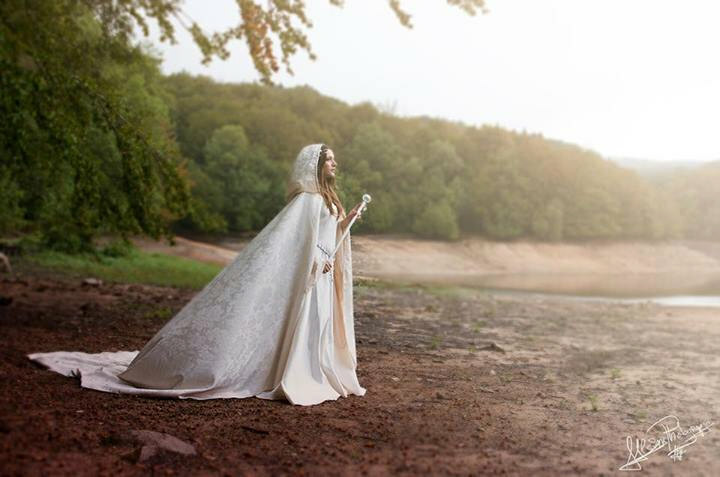 Some people choose to wear cosplay outfits and others fairy wings and glitter (for inspiration, see our article on pagan wedding dress themes). 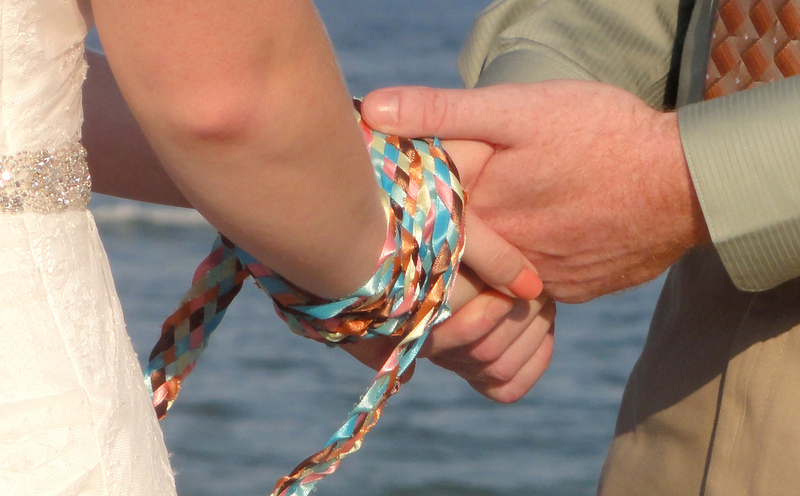 Handfasting can be as formal or informal as you like. It can be a large ceremony that you follow with a dinner and dancing, much like a modern-traditional wedding. Or it can be a small gathering of close loved ones. You can choose an indoors wedding venue, or choose to have the ceremony outdoors (a very popular choice) and follow it up with a celebration afterwards. I’ve known of people who have chosen to get handfasted during Summer Solstice outdoors and everyone camped overnight, celebrating with BBQ food. Others have chosen a country house with a formal ‘sit-down’ meal afterwards. There are lots of venues and officiants that offer formal handfasting ceremonies. These can range from druid priests offering handfasting at Stonehenge, to Scottish officiants offering Celtic sword-ceremonies and traditional poetry. If you are a member of a Wiccan or Pagan group then a member of the group or coven may offer to perform a handfasting in line with the individual traditions your group follows. Or, if you would prefer for a friend or family member to officiate then they can perform the ceremony for you. Some people have a handfasting ceremony and tie it in with a ceremony at a registry office in order to make the marriage legal in places like the UK. Others are simply content to declare themselves to each other rather than have two ceremonies. Depending on your circumstances and what status you’d like your union to have legally you can choose to combine ceremonies or not. 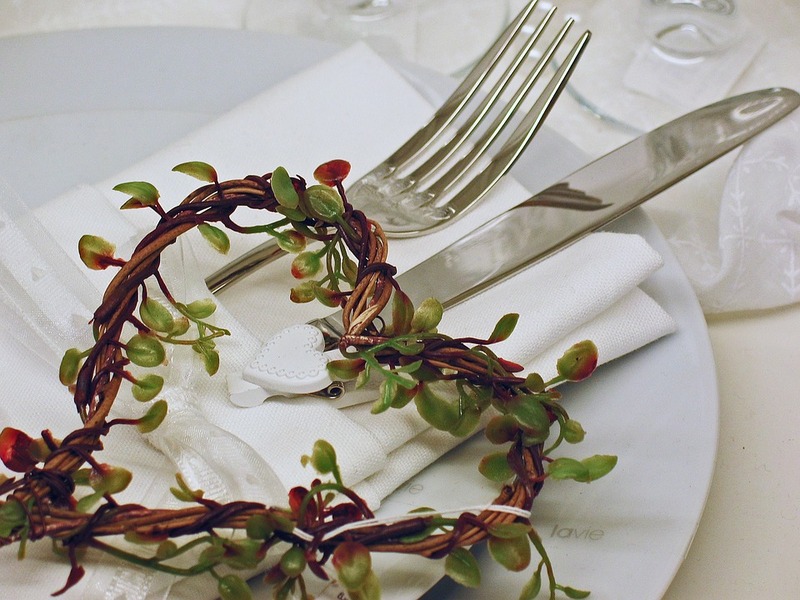 In some venues you may be able to have a legal marriage ceremony at the same time as the handfasting. Research the venue in question and the local registrars to find out what services they offer as this will vary in different locations. A beautiful way to find guidance towards the ceremony you seek is to spend time with your intended thinking about what a ritual union means to you and your mutual reasons for considering this. Discuss what’s important to you both and how you view your union. This will really help to give you ideas on the best place and method for the ceremony. Although a handfasting can be very informal, and be done with very little prior planning, remember that it is a commitment ceremony and will create energetic bonds between you both. Therefore, while handfasting is wonderful for its ease of access it isn’t something that most people advise you do on a whim. Take your time to consider why you want to get handfasted and use the preparation time to focus your intention. The beauty of handfasting is the freedom it allows you to have your ceremony pretty much anywhere you like, as long as that place allows gatherings and celebrations. So, spend some time researching or even visiting sites that you feel resonate with you both and where the energy feels ‘right’ for a blessing of your union. Some friends and family might not be familiar with handfasting practices or what it means to have one. If you intend to invite your close and extended family then it can be worthwhile creating a small information sheet to be included in the invitation to let people know what to expect. If you’re having your ceremony outdoors and plan to invite older people, try to ensure they have somewhere to sit, and also a place for guests to go to shelter if it rains or if they need a bathroom break. Check with the venue that they allow these kinds of ceremonies to take place (at Avebury and Stonehenge you can just arrive and have the ceremony when you like) and if there are any rules about fires if you intend to light one to jump over. Bear in mind that if you choose a public venue such as a stone circle there are probably going to be tourists around who may get curious and want to know what you’re doing. You may gather a bit of a crowd! It could be worthwhile assigning a couple of members of your wedding party the job of keeping tourists informed about what you’re doing and answering any questions they might have. Writing your own vows can be a magical part of any ceremony and even more so when used in a handfasting. Even if you’re not a wordsmith, a few lines you have written yourself can add intense power and conviction to your ritual. Creating your own handfasting cloth using woven ribbons or even embroidering your own cloth can also be a gorgeous way to focus your intention and the energies you are invoking together. As with many rituals, the more you personalise and get involved with the ritual tools and preparations the more it empowers you both. If you want to combine your handfasting with a legal marriage then in my experience it’s often better to have the legal ‘formalities’ performed first, so that your energy can then be freed up for the ritual and spiritual space of the handfasting. The legal ceremony often feels a little less emotional for many people, however it can be a brilliant opportunity to focus your mind and begin your special day grounding and earthing yourself. Most importantly – Enjoy yourself and see this day as a magical one where you are uniting spiritually with the person you love. This is your time to express your unique bond and personality, with each other and with those you choose to help you celebrate. Have a wonderful pagan wedding!